PIRIT Heated Hose - Heated Water Hoses - Titan SW344 Aircraft Jac-Riser Hose and Goodyear Wingcraft Hose - Aircraft Refueling Hoses - JGB Enterprises, Inc.
How Heated Hose works - It Flows When It’s Freezing! You can now have running water 24/7 in below-freezing weather. No more frozen waterlines! The heater wires are extruded directly into the walls for uniform heating and unrestricted water flow. 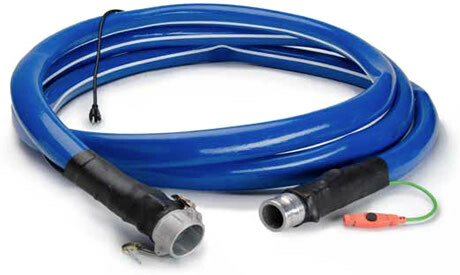 Heated Hoses work in below-freezing temperatures. The hoses maintain a discharge or sewage water line 24/7 throughout the winter or use for periodic tasks. The PIRIT Heated Hose®: A hose that works in below-freezing temperatures. Maintain a discharge or sewage water line 24/7 throughout the winter or use for periodic tasks. Thermostatically controlled. 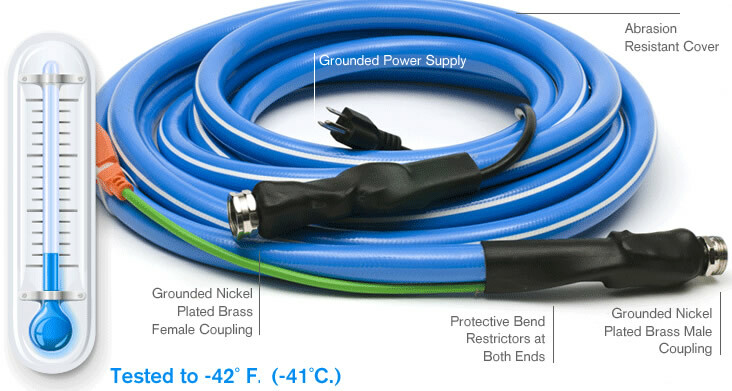 When plugged in the PIRIT Hose® automatically turns ON at 42° F or lower and, when on, turns OFF at 57° F or higher. 2-inch hose made with durable 150 psi PVC and quality aluminum cam-lock fittings. Double-walled PVC Construction with woven outer layer for added strength. Works with standard 110V GFCI outlet and draws only 315 watts. Approved by MET Labs, a NRTL (Nationally Recognized Testing Laboratory) to UL (499) and CSA (C22.2 no.72 #E112826) safety standards for heated electronic appliances for outdoor use. For added safety, the PIRIT Hose® is grounded, end-to-end, including the nozzles. IMPORTANT: This hose is for normal farm and garden use and light commercial use only. Do not attempt to cut or splice hose—serious injury may result. Do not spray water into an electrical outlet. Severe electrical shock could result. Attach camlock fitting to the water source. PIRIT Heated Hose is the Only Cold Weather Heated Hose. PIRIT Heated Hose is used to provide a constant source of water in freezing temperatures. Now available in approximately 12', 25', 50' and 100'.